The notes below are guidelines. The will not likely apply to machines built by other integrators and may not apply to our own machines which could have modified or updated software, hardware, and machine options added or removed. Outlines a procedure to copy and back up the Config files of Anilam 1100, 1200, 1400, 3000, 4000, 5000 and 6000 series controls. A link to the Rex web site discussing the benefits of Drive Isolation Transformers on machinery using inverters and vector drives. A discussion on proper grounding techniques and how to build a very simple test rig to verify the effectiveness of a ground. A discussion on some of the practices in the marketplace today of rating spindle motors on machine tools. Some recent models of the TW-40 and 50 machines can damage the Z axis inside the column with the counterweight. This describes how to maintain correct orientation of the ballscrew and motor when servicing belt drive systems on axis motors. The ballscrew corrections and be knocked out of sync without this. how to replace system backup battery on Anilam controls with Intel 486 PC systems. 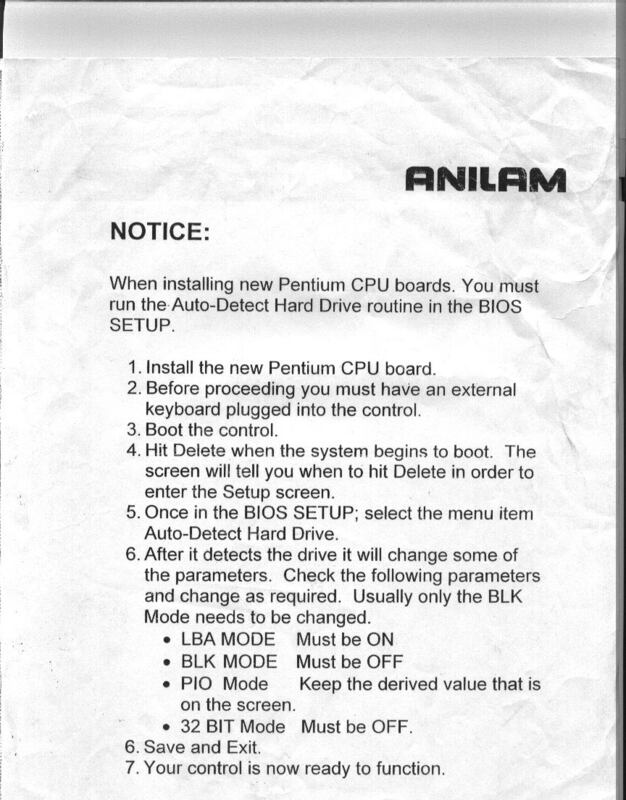 how to replace and re-initialize the CNC on Anilam controls with Intel Pentium PC systems.